[Charles Thomas Courtney Lewis.] Autograph Letter Signed ('C. T Courtney Lewis') to an unnamed recipient, regarding his two books on the publishers Le Blond & Co.
32 Great Queen Street, Kingsway, London, WC2. 4 October 1928. 1p., narrow 12mo. In fair condition, lightly aged and worn. He explains that he has 'not written since my Vol in 1920 any Book on Le Blond except the one just published of which I enclose the Prospectus & do not contemplate any other'. He points out the differences between the two volumes and ends with an offer of help. [Henry Courtney Selous, nineteenth-century historical artist.] Autograph Signature ('H. C. Selous') on part of letter addressed to J. Watkins of Liverpool. [Printed pamphlet.] The Commercial Travellers' Benevolent Institution, for the Relief of Aged and Necessitous Members and Widows of Members. Instituted 1849. 12mo, 10 pp. Text clear and complete. On aged and worn paper, with pin holes and a spike hole. 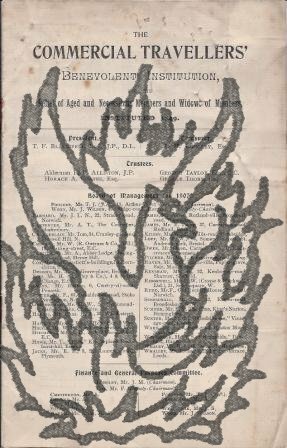 Includes list of the 'Board of Management for 1907', accounts, 'Statement of Accounts, December 21st, 1901, to December 20th, 1906. 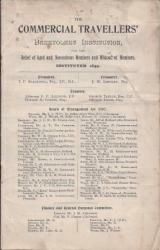 Compiled by Mr. J. M. Longley, Treasurer and Chairman of the Finance and General Purposes Committee.' 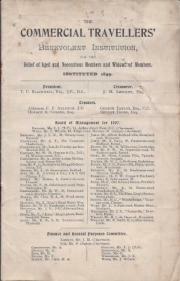 Also 'Report Presented at the Half-Yearly General Court, 27th Dec., 1906.' The 'Result of Poll', 'December Election, 1906', by Courtney, contains lists naming 'Successful Candidates' and 'Unsuccessful Candidates'. Typed Note Signed ('W L Courtney') to Miss E. F. Davies. 19 November 1907; on letterhead 53 Gordon Square, W.C. [London]. One page, on piece of paper roughly seven inches by eight wide. On aged paper laid down on a piece of card, and with some wear and paper and glue stains. 'My dear Madam, | In reply to your letter of Novr. 18th, I have pleasure in sending you my autograph, as you desire.' Four-line printed biographical cutting in bottom right-hand corner.